Africa is in native dress with lots of bracelets and gold trim, introduced in 2009 she's now retired. 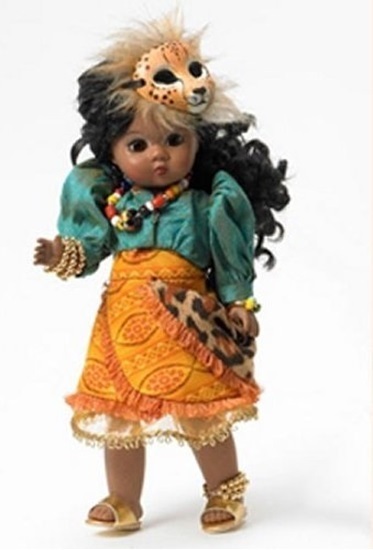 This 8 inch Madame Alexander doll is dressed in an African tribal outfit including a dark teal taffeta bolero with puffed sleeves, a patterned rust and gold colored dress with a front openng, and a gold slip, plus bracelets, a necklace, an anklet bracelet and a leopard Mask. She has long black curly hair, brown eyes, bent knees, and dark skin. Africa is part of Madame Alexander's International Collection.